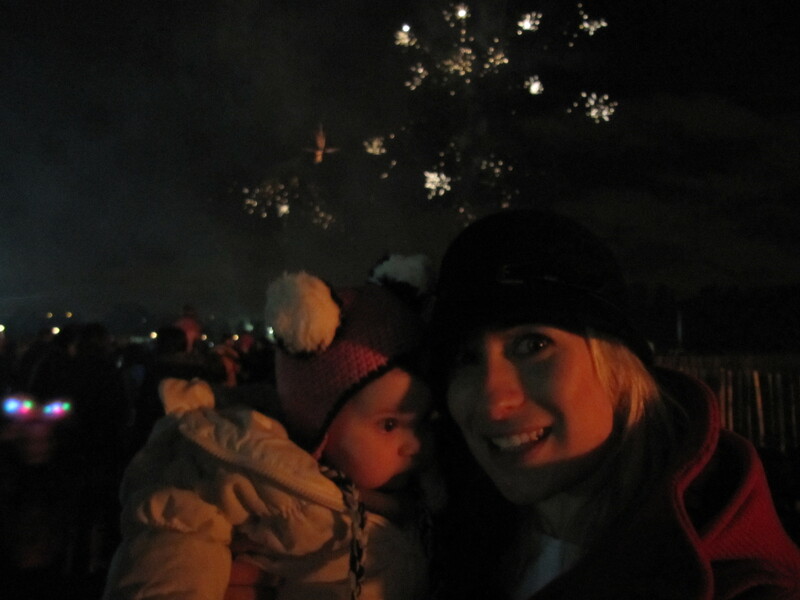 It’s Bonfire night here in London and we went out and celebrated it in Wimbledon Park. We met up with Jason, Jo, Henry and baby Lucille. Mummy covered me in lots of layers so I stayed warm (even though it was a fairly warm night for November). She also had a some ear muffs to block out the noise but I didn’t like them. There has been fireworks going off all week so I wasn’t scared of the loud noises they make and I had heard them before when they took me to the Sydney New Years fireworks when I was in mummy’s tummy last year. 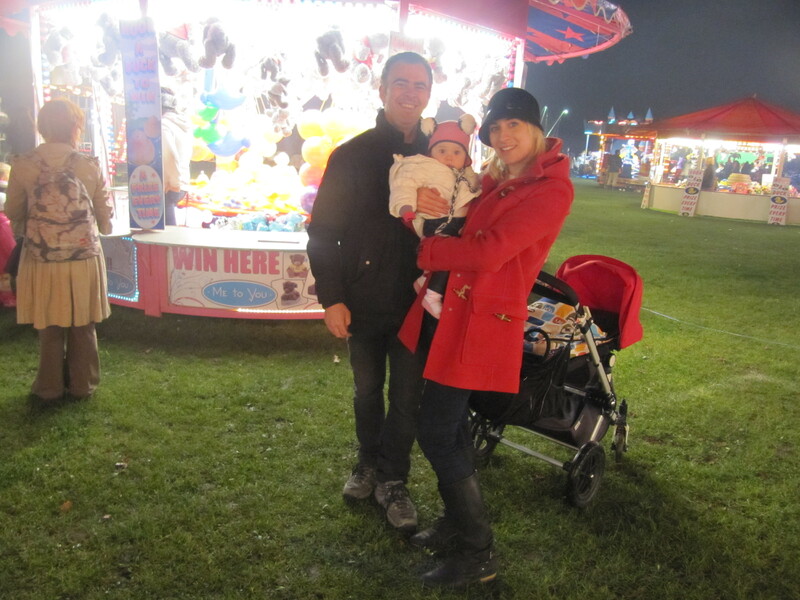 We arrived early and to our surprise there was also a fun fair in the park. Mummy got very excited as she likes the rides and promised to take me on a(not to crazy) one. We looked for a little while for a ride that was suitable for me and we settled on the Tea Cups. 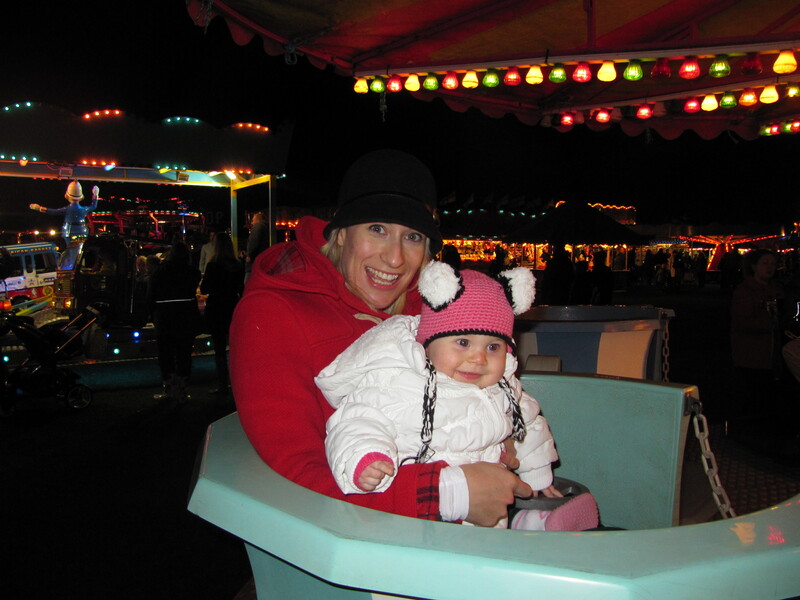 I don’t think mummy realised how fast those tea cups spin around and she doesn’t like spinning rides. 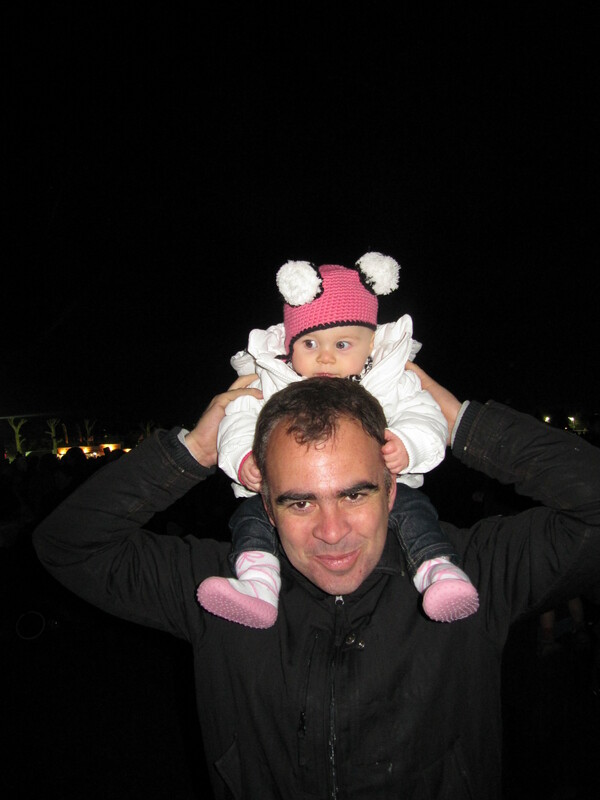 Daddy took lots of photo’s of my first ride at a fun fair, it was really cool but mummy didn’t feel so well afterwards. At 6:45 they lit the big bonfire. It was really cool and it helped keep everyone warm. 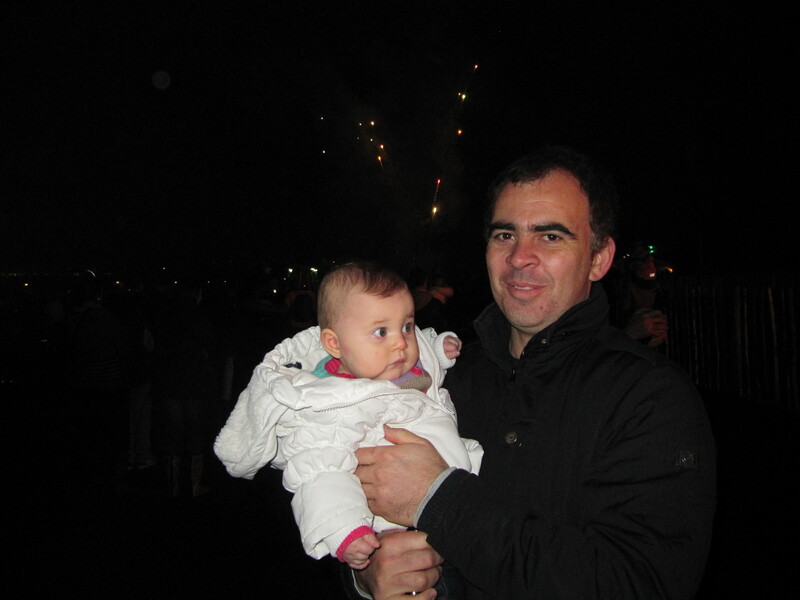 Then they set off the fireworks! 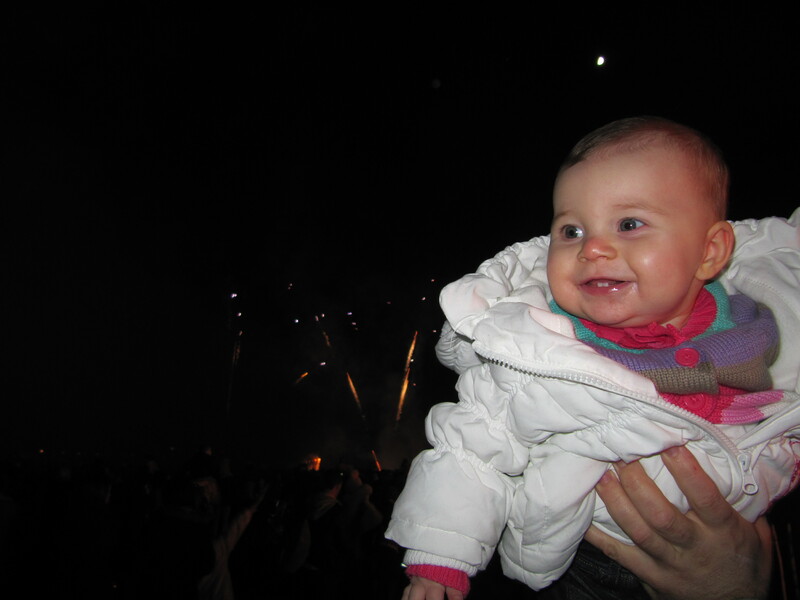 It was pretty exciting, all the bright colours and loud bangs all went off in time to Disney music and Katy Perry. I am not sure who enjoyed it more, mummy or me! Guy Fawkes Night is an annual commemoration observed on 5 November, primarily in Great Britain. Its history begins with the events of 5 November 1605, when Guy Fawkes, a member of the Gunpowder Plot, was arrested while guarding explosives the plotters had placed beneath the House of Lords. Celebrating the fact that King James I had survived the attempt on his life, people lit bonfires around London, and months later the introduction of the Observance of 5th November Act enforced an annual public day of thanksgiving for the plot’s failure. I also learnt this week that my G-Nan and G-dad met at a bonfire night celebration in London. Getting a birds eye view with the help of daddy's shoulders. This morning mummy and I had a visitor in Chiswick. Mummy’s best friend Kristy came to meet us for brunch. We had a brunch in a little french restaurant called the French Kitchen, they had scrambled eggs and Salmon. I wasn’t so lucky I just had toast soldiers (minus the googy egg). Mummy has been making me all sorts of yummy treats and I have really expanded my ‘palate’. For a while there I only wanted Weetbix for breakfast, lunch and tea. However she bought a new hand blender and has started to make all sorts of yummy things. Some of my favourite meals at the moment is Spag bol, cheesey smashed veg, fruity chicken and pretty much every bit of fruit I can get my hands on. Strawberries are still my favourite! Also other news is that I am fully signed up to Scallywags modelling agency. 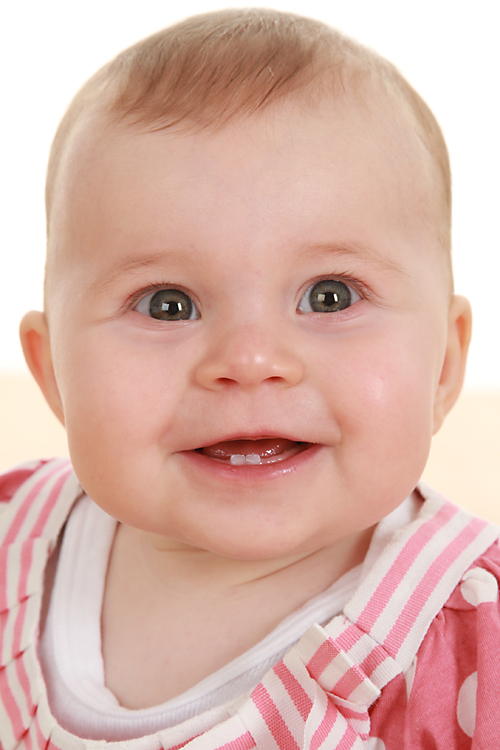 Mummy was sent my interview photo’s so I have uploaded a couple. I really hope I get some work as I love the camera! So far this week has been pretty exciting with Halloween and Bonfire night, but we also had some wonderful news – Mummy’s friend Sarah got engaged to her boyfriend Danny – so a big Congratulations to you both, how exciting! Next week should be just as exciting and full of more wonderful news as my Aunty Jen is due any day now. I can’t wait to meet my new cousin, when he arrives and mummy and daddy’s friends; Jason and Heidi are expecting a baby any day infact Heidi is already a couple of days overdue. Their baby is a surprise so we can’t wait to hear if baby Atkins is a little girl or boy. Either way there are lots of new babies for me to play with when we come back for holidays. Goodluck Aunty Jen and Heidi. 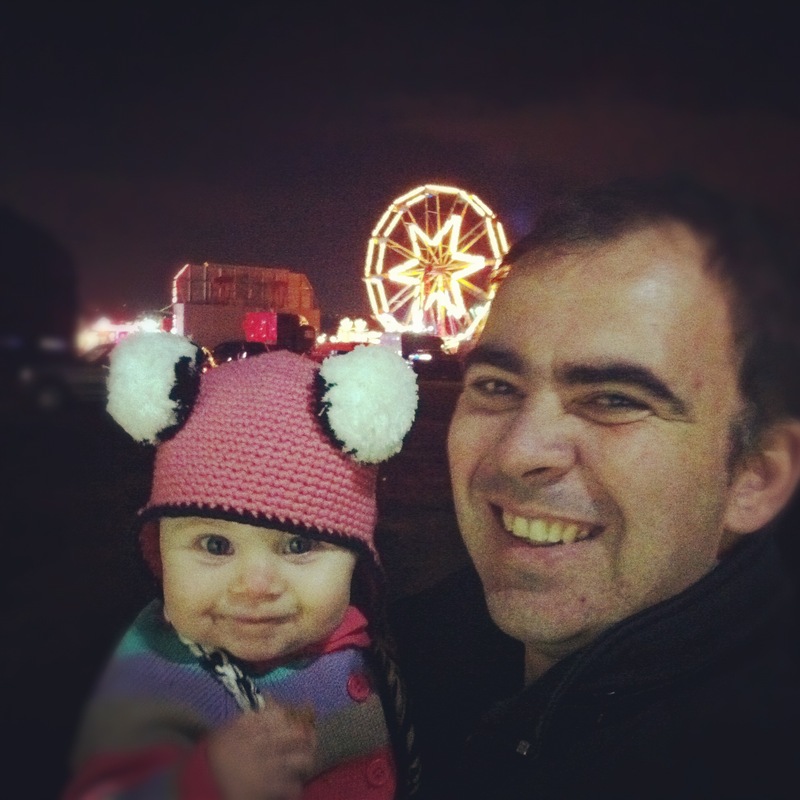 It’s been a while since I have updated my blog, I blame mummy. She is always doing other things and since th internet is still not working she uses that as an excuse as well. The internet in our flat will be fixed in two weeks so we promise that we will blog more often. Mummy has been saving up lots of pictures to post and will do another video montage very soon. 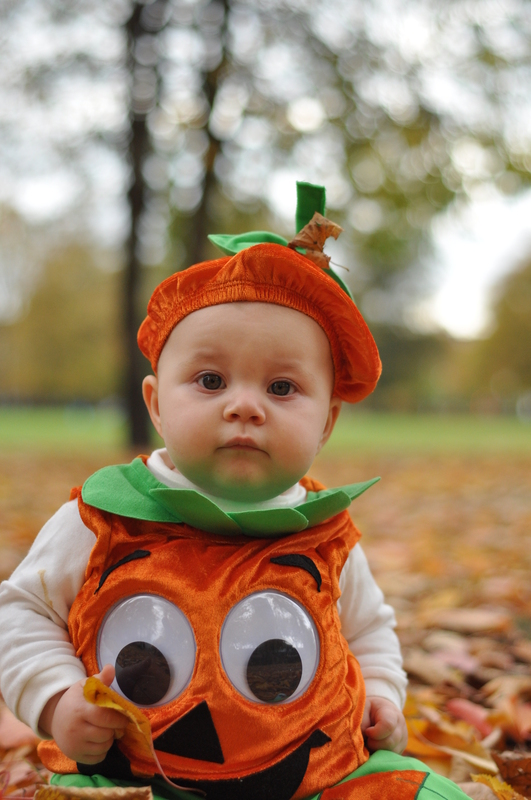 Yesterday was Halloween so mummy dressed me up for the day as a Pumpkin. 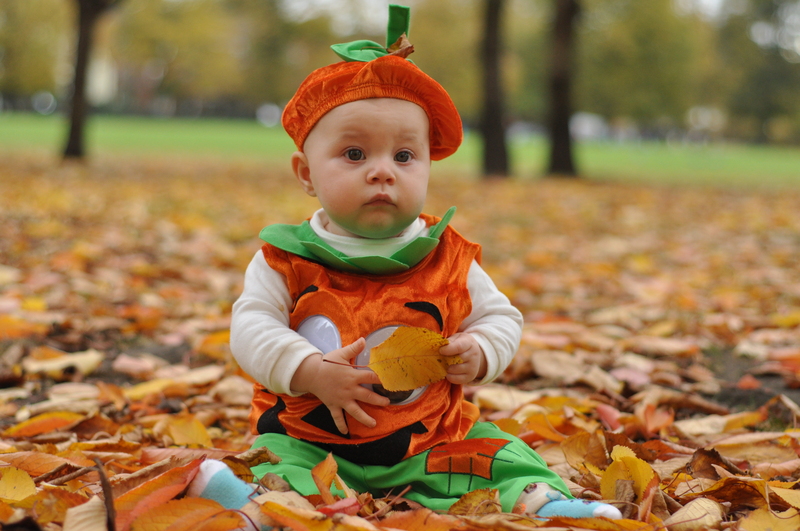 After she did her thing in Starbucks and after I had my morning snooze we went to the park so she could get lots of photo’s of me playing in the Autumn leaves – as a Pumpkin! Lots of people stopped and commented on how cute I was and tried to help mummy make me smile for the photo’s. We found a really good spot to play in the leaves, the problem in Chiswick is that they rake up the leaves in the park closest to our flat. So mummy has been looking for a good spot to get some Autumn pics for a while now. We found a great spot in the park across from Starbucks. We didn’t go trick or treating but mummy promised to take me next year. I am really getting up and about the flat these days. I can properly pull myself up to a stand and today I started to walk around a little bit using the sofa as a guide. I got up on my two feet and mummy was sitting at the other end of the sofa so I tried to get closer and took a few steps before she helped me. She was a little worried I would fall and hurt my bottom. She was very happy and proud of me. I don’t really sit still anymore, which is great for me as I love to explore but mummy doesn’t get a minute to herself, even when she jumps in the shower, I go searching for her. Today I did something very silly I crawled under the coffee table and was going really well until I got a bit stuck halfway. Mummy watched me do it and thought it was funny until I started to get a little scared. Last night mummy was telling me that it was Melbourne Cup day back in Australia. Melbourne Cup is the biggest horse race in Australia and it happens every year on the first Tuesday of November. It sounds like a lot of fun and supposedly mummy usually has some good luck, picking the winner. She had a quick look at the horse lineup and chose a random horse called Dunaden and she tried to put a bet on using daddy’s phone but it didn’t work. Bugger! She found out this morning she would have won! We should have called Omi and got her to put a bet on for us then she could put the winnings in my bank account.